Samsung’s SmartCam HD Plus was one of the first DIY security camera’s we reviewed that improved upon the Dropcam blueprint. 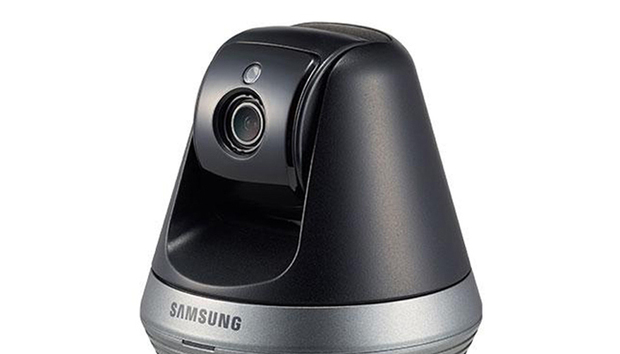 Now Samsung has added the SmartCam PT ($229) to its lineup. This pan-and-tilt model lets you see into the blind spots stationary home security cameras can’t reach, and it comes with a few well-thought-out features that set it apart from its many competitors. If you’re of a certain age, the SmartCam PT (available at Amazon) will likely evoke the old Apollo command modules: a truncated cone that comes to a blunt point. The hollowed out center holds the camera itself, and the black upper part of the cone swivels on its gray base. Set on a shelf, it doubles as an interesting knick-knack, but you can also secure it to a supplied bracket with thumbscrew and mount to a wall. The camera's lens has a 96-degree field of view, and the unit it’s housed in pans 350 degrees and tilts on a 155-degrees arc. This flexibility allows for set-it-and-forget it placement; once the camera is pointed toward the room you want to monitor, you’ll have a lot of viewing-angle options without ever needing to manually reposition the camera. The SmartCam PT can be attached to a bracket for wall mounting. The SmartCam PT boasts most of the features we now expect from home security cameras, including motion and sound alerts, two-way audio, and night vision. But it also includes a few surprises, such as a privacy mode you can enable when you’re in your home, and an auto-tracking feature that allows the camera to follow a single person or object. Like the Samsung SmartCam HD Plus, the SmartCam PT can record up to 128GB locally to an onboard microSD card. That saves you the cost of an ongoing cloud subscription, but it leaves the security of your surveillance footage to the whims of potential intruders who could easily compromise the camera. The SmartCam PT is controlled with the same Samsung SmartCam app as the HD Plus. The initial setup is refreshingly easy, requiring you only to press the Wi-Fi setup button on the underside of the camera’s base for the app to see it, and then follow onscreen prompts to connect to your wireless network. There’s also an option for connecting the camera over your hardwired LAN. Once the SmartCam PT is connected, it appears with the name you gave it during the setup process—along with any other connected Samsung camera’s you might have—on the app’s home screen. Tapping on it takes you the camera’s live feed and command center. From there, you can manually record video to either the microSD card or to your smartphone when you see some action you want to capture, or trigger the mic to communicate with kids or console a lonely pet you’re monitoring. You can also adjust the feed’s resolution using low, medium, or high presets, although you likely won’t toggle it much as pixels become more obvious on the lower settings. A pan-and-tilt feature allows the SmartCam PT to see into blind spots. The camera’s biggest hook is its motorized pan-and-tilt, and that’s also its greatest strength. Using the four directional buttons, you can long-press to move the camera smoothly along its horizontal or vertical travel, or tap them for incremental movement when you hear something off-camera or just want to perform a sweep of the room. Unlike a lot of pan-and-tilt camera’s, the SmartCam PT has only the tiniest response lag when initiating or stopping camera movement, making this feature very precise. You can also set presets of up to three camera positions that can be triggered with a single touch. The SmartCam PT’s Auto Track is a handy feature if you want the camera to shadow a child or pet you’ve left at home. Tapping the Auto Track button, which looks like a set of crosshairs, locks the camera on to the nearest moving object. It works really well, though it sometimes had trouble distinguishing between a moving body and a moving body part. At one point, I had the camera trained on my son as he played in the living room. The SmartCam PT dutifully bird-dogged him around until he unexpectedly shot an arm in the air, which sent the camera careening upward until it locked on his hand. Auto Track will lock onto and follow the nearest person or object. Out of the box, I found the SmartCam PT’s motion and audio detection a little too sensitive, which caused a bombardment of alerts over benign events. The SmartCam app lets you adjust the sensitivity of audio and motion sensors independently—or turn either off completely—and with some trial and error it was fairly easy to get a more balanced calibration. You can also restrict monitoring to up to three motion-detection zones, such as entry points to a room, which significantly cuts down on false alarms. Even better is the camera’s privacy mode. Instead of turning off motion and audio detection or unplugging the camera when you get home, you can activate this feature, which tilts the camera toward its base and shuts it down. You can also schedule privacy mode to activate automatically at certain times of day, such as when your children get home from school if you’re monitoring while you’re at work. The SmartCam PT records video at up to 1080p and that’s the resolution you’ll want, as the lower settings are noticeably less sharp. The FullHD setting renders crisp detail, rich colors, and smooth playback making it easy to make out faces in both day and night mode should you have to identify a burglar. Sadly, finding your recorded video clips can be confounding, at least at first. They’re accessed from three different menus, depending on how they were captured. Recordings triggered by sound or motion can be found by date and time in a dedicated Events folder. Manually recorded videos saved to your phone separately and are presented in a list. You just tap one to play it back. Those recorded to microSD card are accessed through yet another playback menu that requires you to choose calendar date and recording type—manual or event-activated—to see your footage. It’s the biggest flaw in an otherwise intuitive app, but once you get the lay of the land it's less bothersome. The SmartCam PT is a great way to monitor a large space without needing to purchase multiple cameras. Its auto-tracking feature is particularly useful if you’re planning to use it as a pet or nanny cam. But it costs significantly more than the D-Link and Vimtag pan-and-tilt security cameras that deliver equally good video quality, but that don't have a couple of the fancy features that Samsung has come up with. If your budget is tight, you’d be just as happy with one of those models. If you don't mind paying more to get more, the onboard storage, auto-tracking, privacy mode, and other added features justify the price premium Samsung is seeking.